Every motorcycle owner knows that changing the battery is part of regular maintenance. However, if you’re new to the whole motorcycle battery replacement process, don’t worry, we’ve got you covered. Our easy guide covers all of the steps for replacing your motorcycle battery. You’ll know your motorcycle needs a new battery when it struggles to start or the engine won’t crank at all. However, you can also replace the battery as a preventative measure when it’s about 3-5 years old. This will help give you peace of mind knowing that you won’t get stranded when using your motorcycle. With a good battery, your engine should always start energetically. The first step on your list of to-dos is to remove the battery from the motorcycle. Typically, batteries are located under the motorcycle seat. Some models may require to use a key to remove the seat and access the pieces underneath. You may need to remove a side panel as well to gain access to the battery, depending on where it’s located. Remember to make sure your ignition switch is in the off position before getting started. Once you’ve located the battery, remove the safety straps holding it in place and pull it out slightly so you have access to the cables. Remove the cable from the negative terminal first using a wrench. Then, remove the positive side before removing the battery completely. If you’re not sure if your battery needs replacement, you can take it to a local motorcycle shop to have it charged and tested. The test will show the battery’s health and help you decide whether or not you should replace your motorcycle battery. With the battery removed, check your cable connectors. If they have any corrosion on them, clean it off with a wire brush. 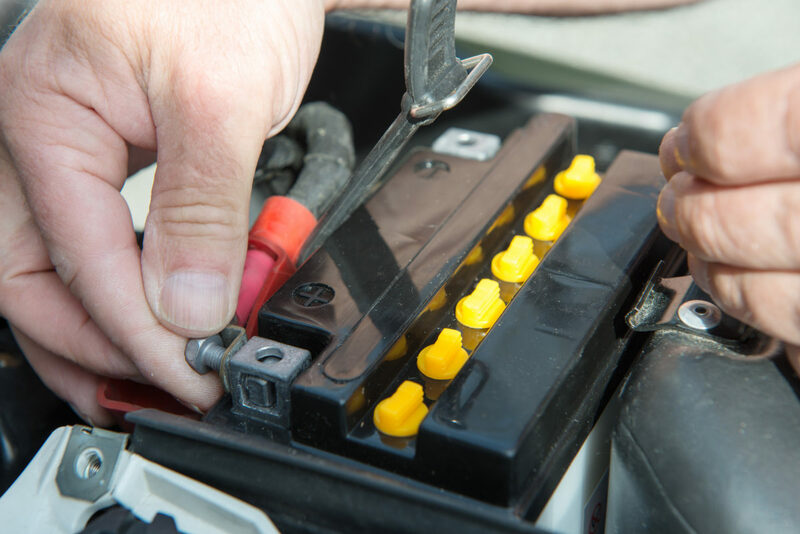 This will ensure your new battery will connect well with your motorcycle’s electrical system. If you decide to replace your battery, check your motorcycle manual for details about what type of battery you should use. You can also use your old battery as a reference. Get your new battery from a trusted sources such as Powertron Battery Co. We offer great motorcycle batteries at a low cost so that you can enjoy riding wherever you’d like on your motorcycle. When installing your new battery, simply slide the new battery into place and attach the cables to the terminals. This time, attach the positive side first and the negative side second. Secure everything in place using the security belt and replace the motorcycle seat. You can extend your battery life by following a few basic rules. First, make sure you don’t leave your bike in storage for excessive periods of time. Take your bike out for a spin every once in a while! Also, avoid driving only for short distances. Your battery needs you to drive for longer distances occasionally in order to fully charge itself. Also, avoid hooking up too many electrical accessories to your bike that will drain its power such as additional lights, alarms and more. Not sure what battery to buy? Ask the experts at Powertron Battery Co. to help you. We’ll be glad to help you find the right battery for your motorcycle.